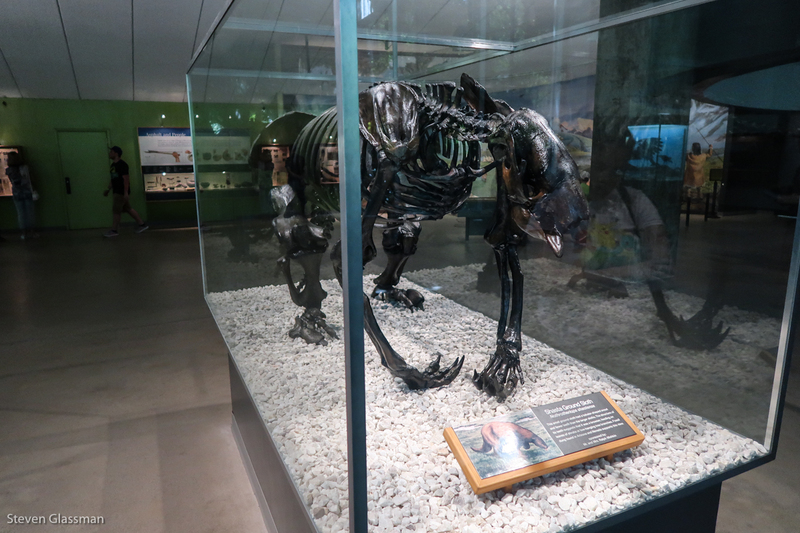 La Brea Tar Pits and Museum – Sunshine. Whimsy. Tacos. 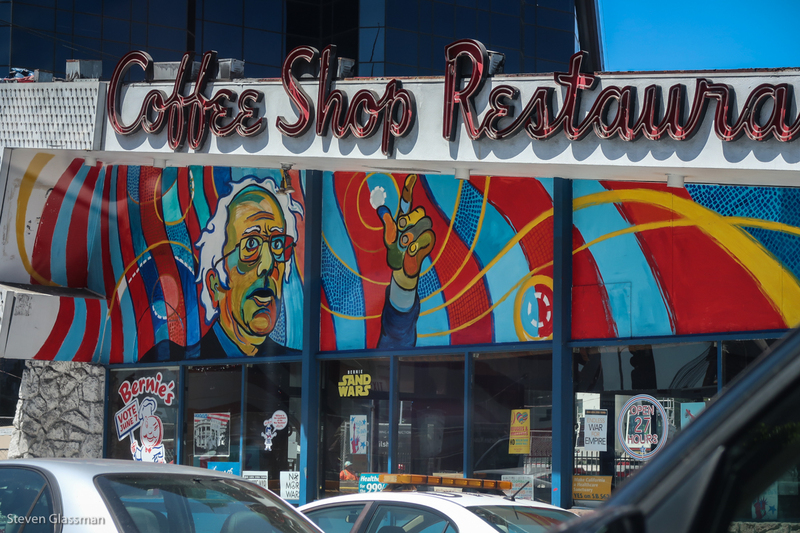 On July 7, 2017 By StevenIn California, Los Angeles, The U.S. 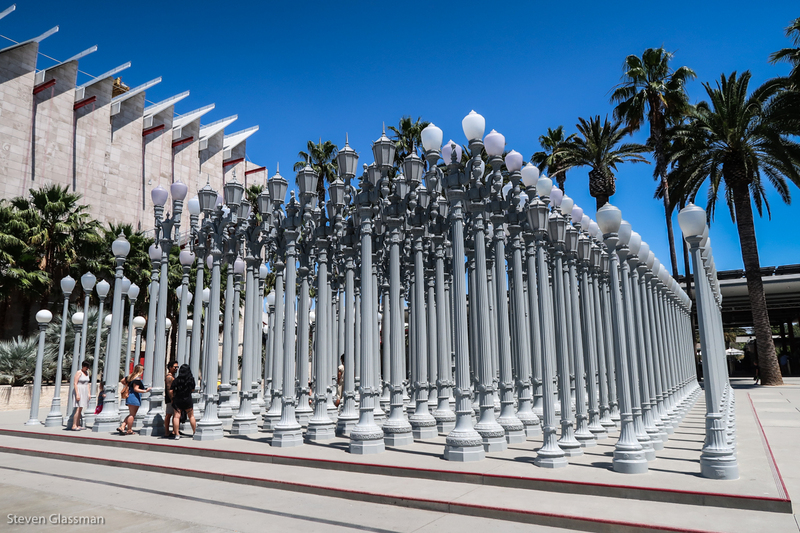 When we arrived at La Brea, our Lyft driver didn’t really know where the best place to drop us off was, so we wound up on the Los Angeles County Museum of Art side. 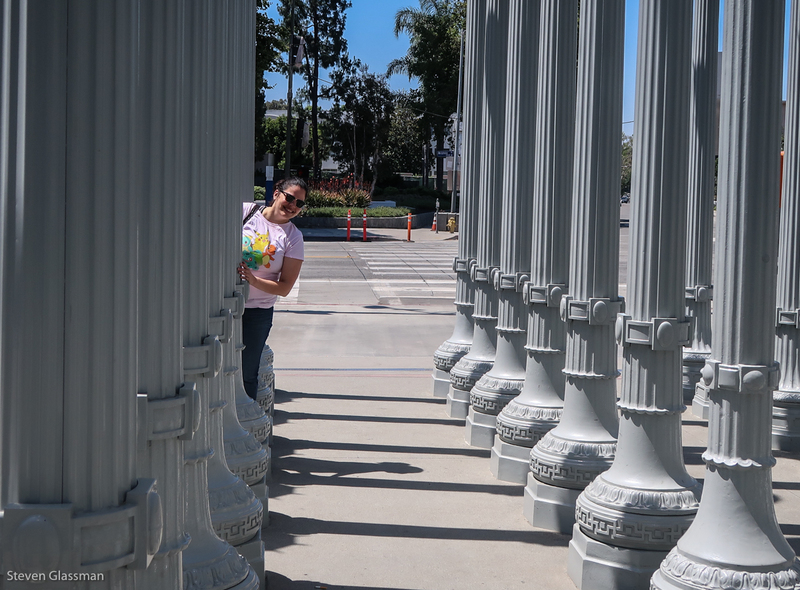 LACMA wasn’t our intended destination, but that didn’t stop us from goofing off near “Urban Light,” the lightpole column installation at the front. 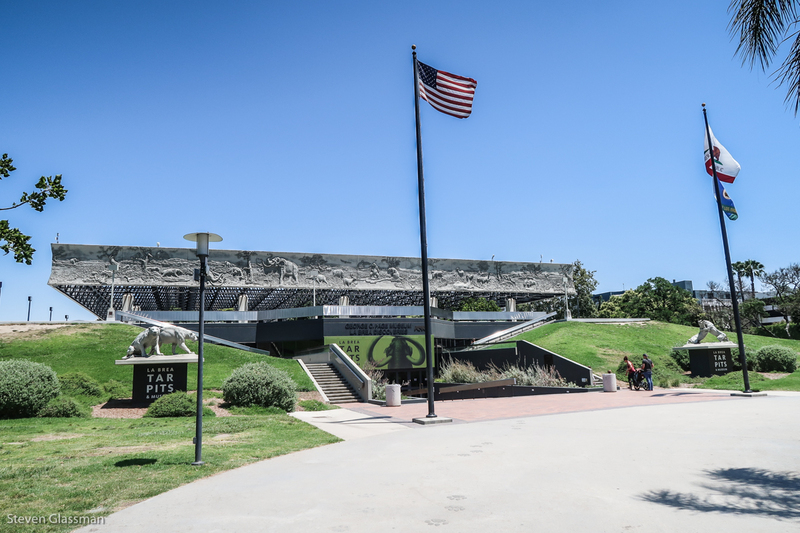 A short walk past the LACMA doors got us to one of the entrances of the Tar Pits. 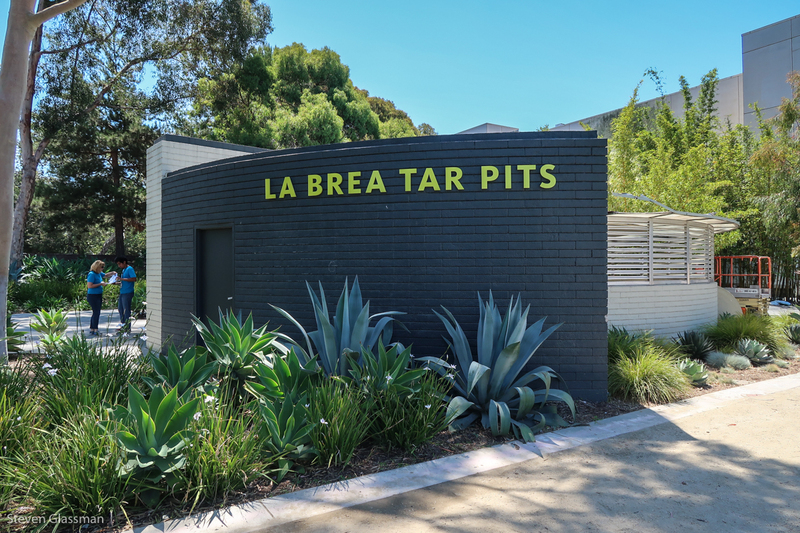 The La Brea Tar Pits are a large open-air park with many different dig sites and individual pits visible. You can actually walk around much of the park without paying an admission fee- the fee is just for the indoor portions of the museum. The structure in the previous photograph is the building surrounding the very first and oldest tarpit dig site. 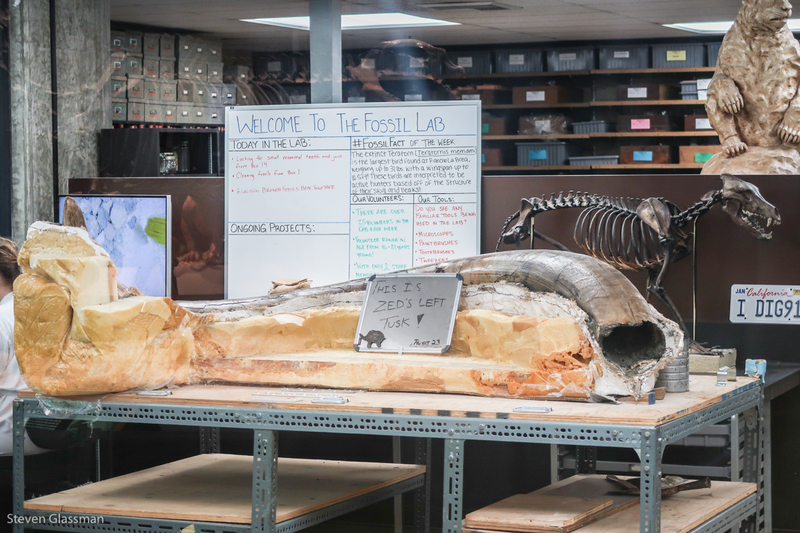 It has been reset to show what a typical pit might contain, and there are four or five distinct species of critter represented in the pile at the center. Some of the pits are active sites, where they are setting up a grid to track where each fossil comes from. In this photo, there are about six species visible, with a tiny colored flag on each one. If you click to expand this photo, you can see a few of them. Most of the pits at La Brea are fenced off and look more or less like a tarry swamp. 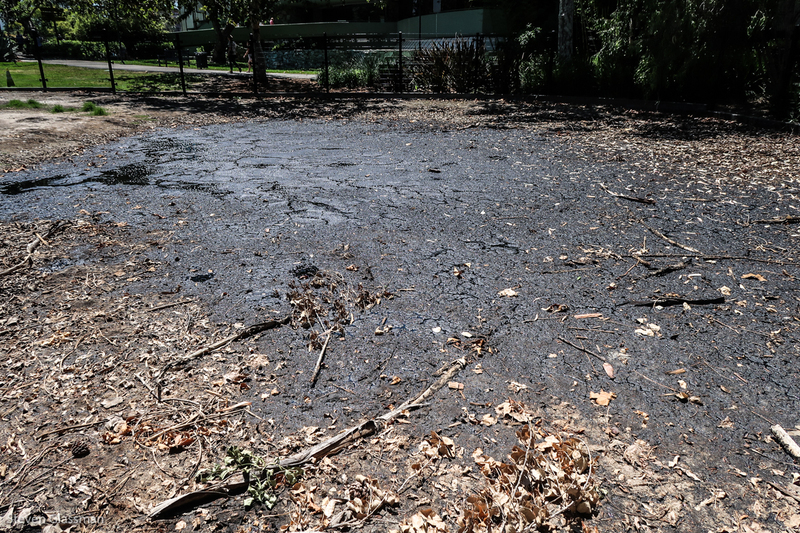 In a labeling error that amuses me terribly, the black gooey substance in the La Brea tar pits isn’t actually tar- it’s natural asphalt. 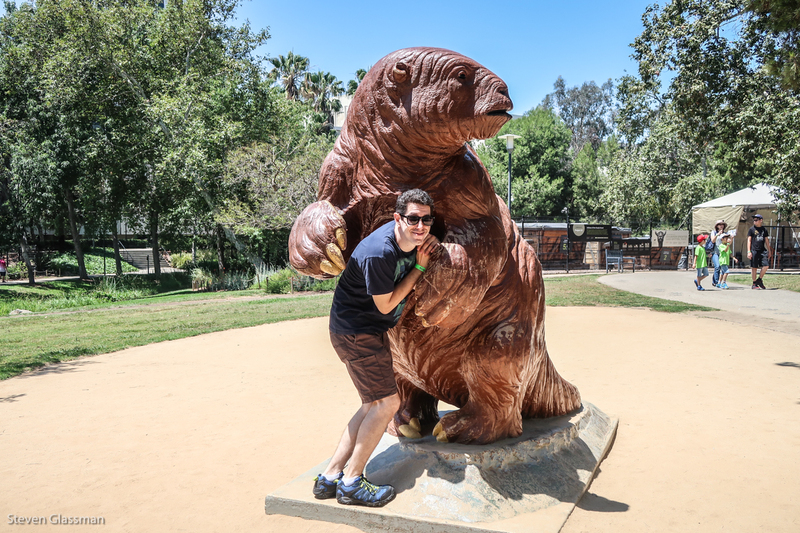 In other news, I cannot resist hugging giant fiberglass sloths. 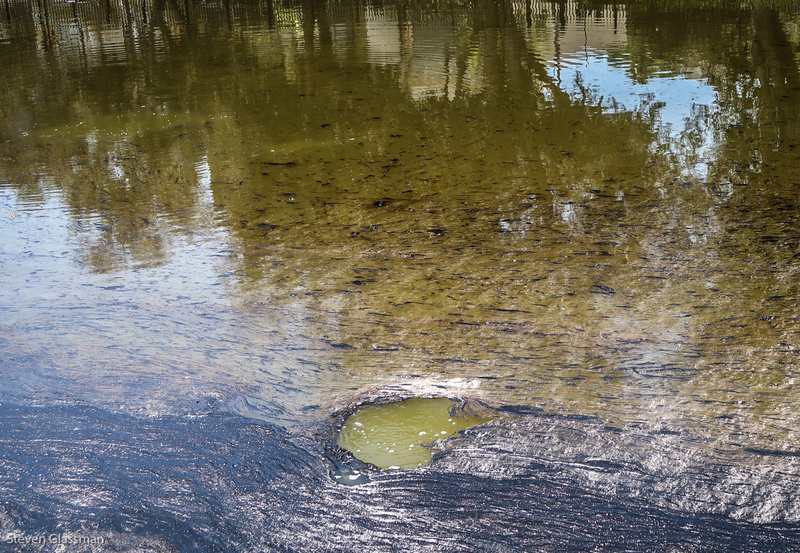 One of the most interesting things about the tar pits is that you can watch the tar bubbling up from beneath. It’s a constant process. 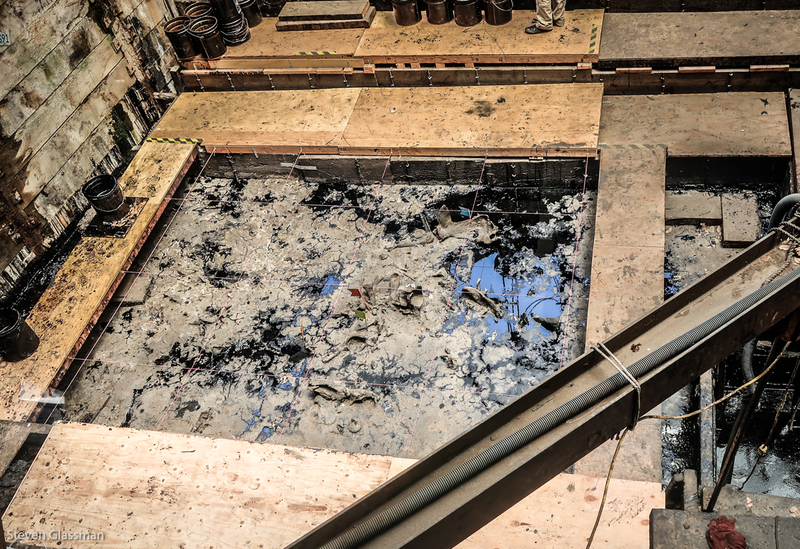 In this photo, a bubble just came up and separated the tar into that round patch you see in the bottom third of the frame. There’s still tar underneath the bubble, though. I can see why so many animals got stuck in what would mostly look like a regular watering hole. 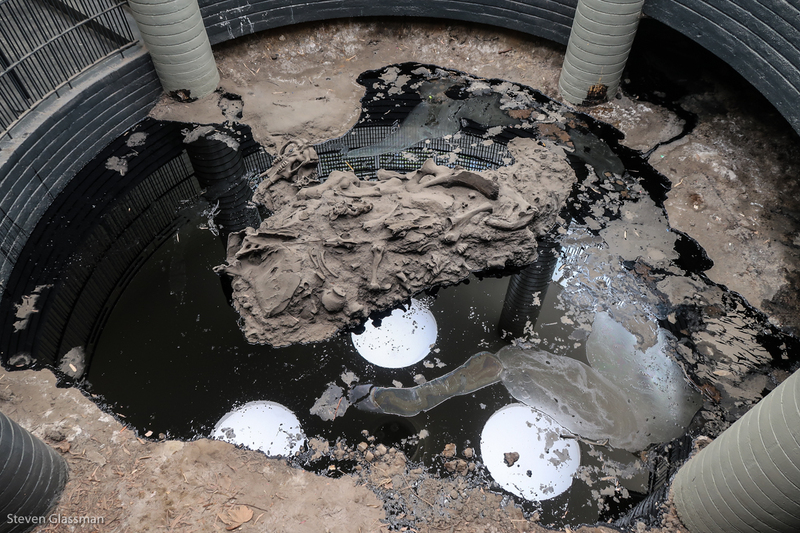 A recreation in the largest tar pit lake of a family of mammoth saying goodbye to one another. It’s historically fascinating, but it’s also really terribly sad. 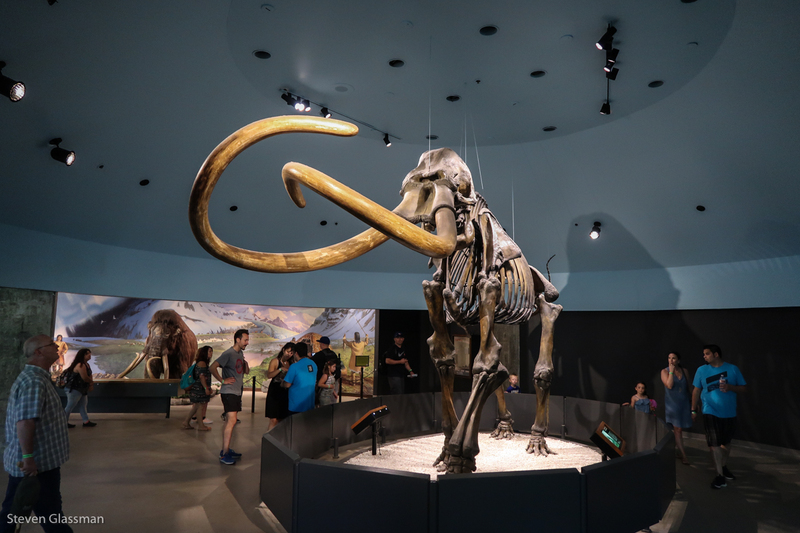 After a walk through the park on a fairly hot day, we were both happy to see the museum portion of La Brea, because air conditioning. 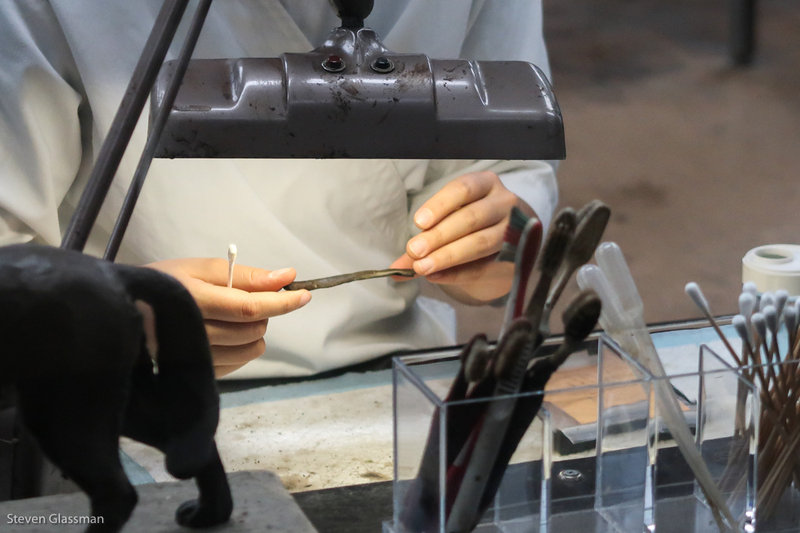 The paleontologists inside are doing finely detailed work, sifting for bones and micro-fossils. During this part of the day, I could not stop myself from humming the Indiana Jones theme music, even though these are paleontologists, not archaeologists. Zed’s Left Tusk is my new favorite name for my hypothetical 70s funk band. I’m pretty sure that this skeleton is what comes to mind when most people think of La Brea. This guy is the giant sloth again. They look dangerous from the skeleton, but they were herbivorous and mostly wanted to have some food and a nap. 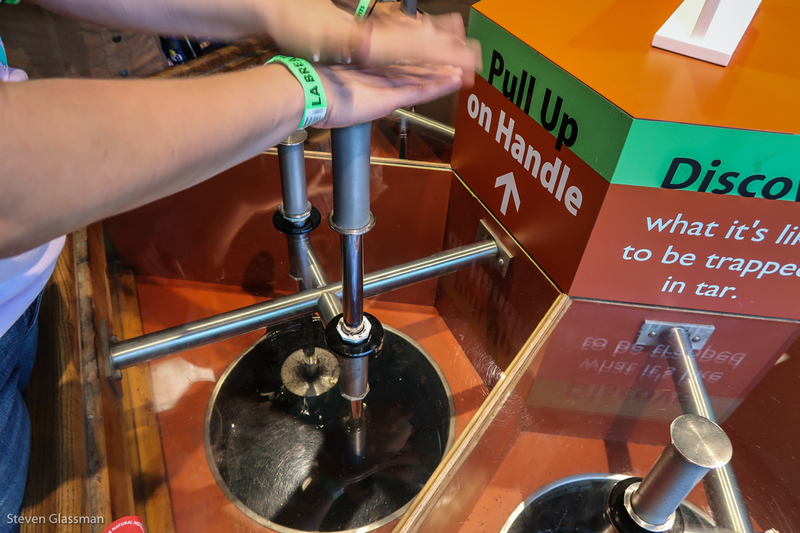 There’s a display in the museum with metal rods dipped in asphalt from the tar pits, to demonstrate how viscous the stuff really is. It is not at all easy to move the rods up or down. Scary stuff. 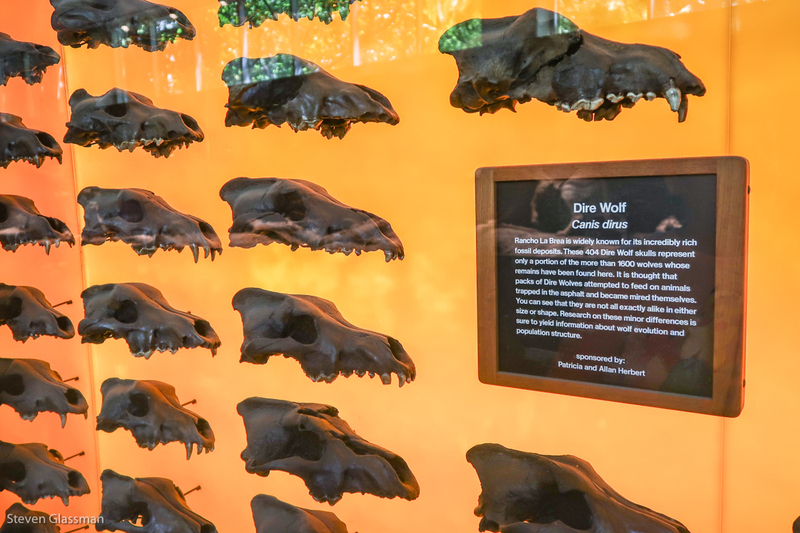 Have you ever been to the La Brea Tar Pits? I have no been there yet. 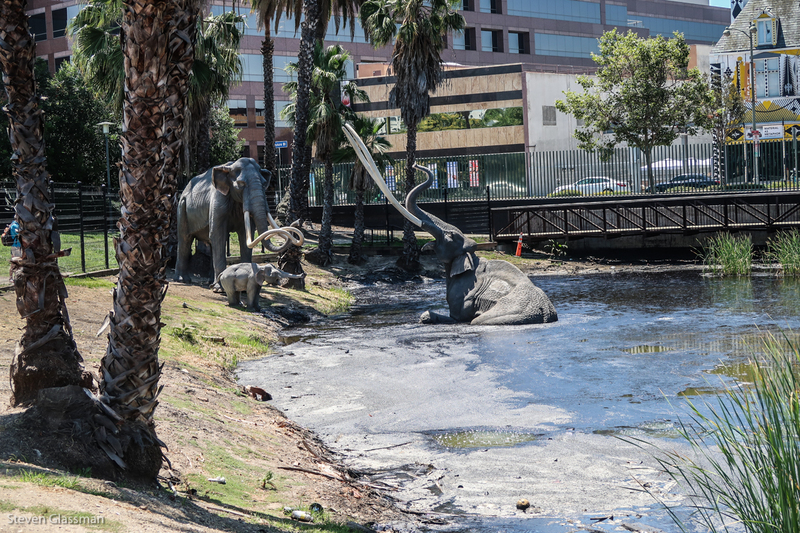 However, I watch the film “Miracle Mile” every year and the tar pits play a critical role in the plot. Seeing your posts from CA reminds me of when I went with my family and saw much of the same things. 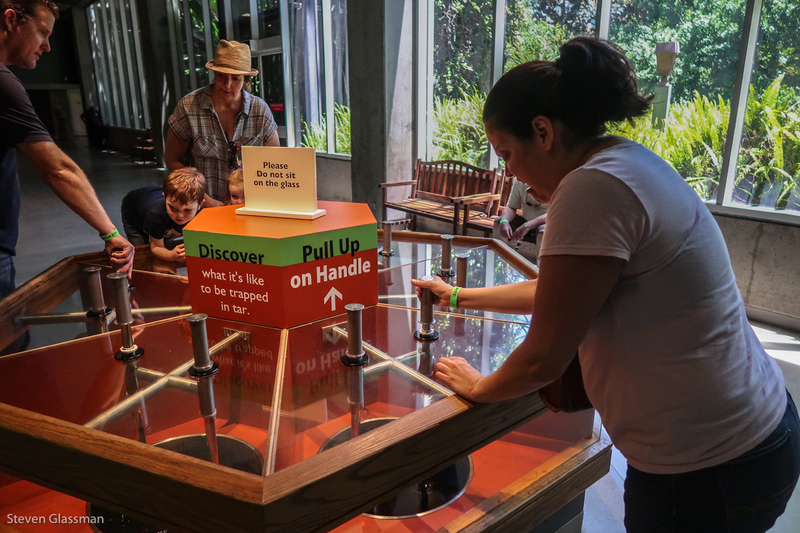 Going to places like the Tar Pits really is a wonderful experience!